28 W INTER 2019 PracticeLink.com ▼ CV T HE Qu AL I T y O f L I f E ISS u E D E P A R T M E N T S Job Doctor CH a R le N e P loty C ia te RR i H ou CH e N l ooking for that work/life balance? Aren't we all. Here's how to find it. ye S, a H ealt H y W o RK/ life B ala NC e i S a CR iti C al C o MP o N e N t of you R J o B-S ea RCH S t R ate G y . But it's also a complex issue with many personal nuances. So before you get enticed by an opportunity that professes "work/life balance," first consider what exactly that means to you and your family. Figure out what you value most in your work and in your home, and how the interplay of those factors should be structured to result in your best overall health. Also consider what your life might look like a couple of years from now, and how your needs might change. 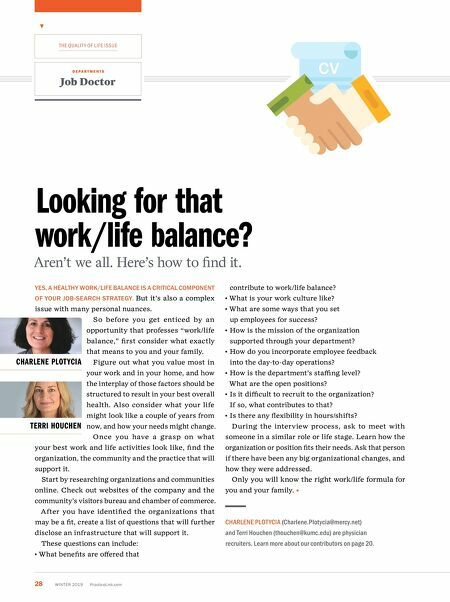 Once you have a grasp on what your best work and life activities look like, find the organization, the community and the practice that will support it. Start by researching organizations and communities online. Check out websites of the company and the community's visitors bureau and chamber of commerce. After you have identified the organizations that may be a fit, create a list of questions that will further disclose an infrastructure that will support it. These questions can include: • What benefits are offered that contribute to work/life balance? • What is your work culture like? • What are some ways that you set up employees for success? • How is the mission of the organization supported through your department? • How do you incorporate employee feedback into the day-to-day operations? • How is the department's staffing level? What are the open positions? • Is it difficult to recruit to the organization? If so, what contributes to that? • Is there any flexibility in hours/shifts? During the interview process, ask to meet with someone in a similar role or life stage. Learn how the organization or position fits their needs. Ask that person if there have been any big organizational changes, and how they were addressed. Only you will know the right work/life formula for you and your family. 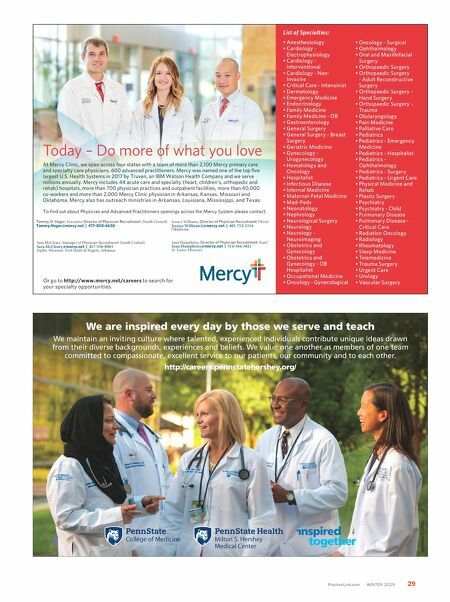 CHARLENE PLOT YCIA (Charlene.Plotycia@mercy.net) and Terri Houchen (thouchen@kumc.edu) are physician recruiters. Learn more about our contributors on page 20.